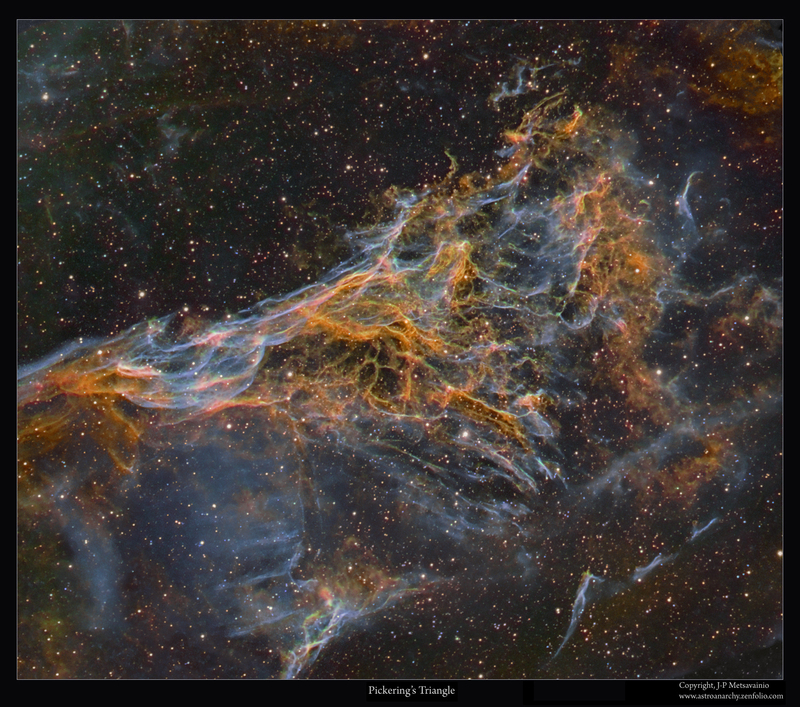 Explanation: Chaotic in appearance, these filaments of shocked, glowing gas break across planet Earth's sky toward the constellation of Cygnus, as part of the Veil Nebula. The Veil Nebula itself is a large supernova remnant, an expanding cloud born of the death explosion of a massive star. Light from the original supernova explosion likely reached Earth over 5,000 years ago. Blasted out in the cataclysmic event, the interstellar shock waves plow through space sweeping up and exciting interstellar material. The glowing filaments are really more like long ripples in a sheet seen almost edge on, remarkably well separated into the glow of ionized hydrogen and sulfur atoms shown in red and green, and oxygen in blue hues. Also known as the Cygnus Loop, the Veil Nebula now spans nearly 3 degrees or about 6 times the diameter of the full Moon. While that translates to over 70 light-years at its estimated distance of 1,500 light-years, this field of view spans less than one third that distance. Identified as Pickering's Triangle for a director of Harvard College Observatory and catalogued as NGC 6979, the complex of filaments might be more appropriately known as Williamina Fleming's Triangular Wisp.